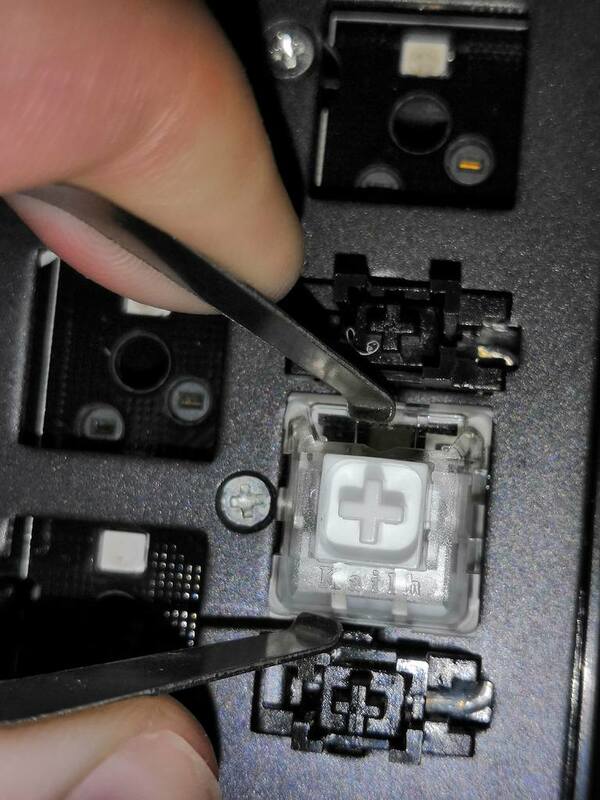 I need help removing the switch from the long "enter" key and "+" key switches in the ten-keys area from the board. The tool they provide doesn't fit for these 2 keys on the board, the stabilizers are blocking from accessing the remove mechanism underneath. Am I missing something here? The keyboard model is tecware phantom elite modular keyboard. i5 4690k, Z97m gaming, Kingston Savage 2x4gb 1600, Msi r9 290, Phanteks Enthoo Evolv, WD Blue 1tb, CM V650, Asus VX239H, CM Quickfire Rapid-I, Logitech G502. Try a different tool or a knife or try prying from the sides. The retention clips aren't all that strong and you don't really need to press them in to remove the switch.